On Tuesday 5th September, Aims Advocacy’s Conversations in the Crafternoons group descended on the Gallery of Modern Art in Glasgow to hold their event Sew-cial Sessions. As part of Marlie Mul’s ‘This Exhibition has been Cancelled’, the group organised this one day event, to share their art, skills and conversation. Sew-cial Sessions explored the visible and invisible barriers we feel exist to getting our voices heard, and we hope that through displaying our work we can get our ideas out there and raise awareness of mental health. The exhibition was made up of a series of handmade portable tents, which the public were able to explore in the space. Crafting in a group gives us the focus and relaxation to be able to speak up about our opinions and experiences. 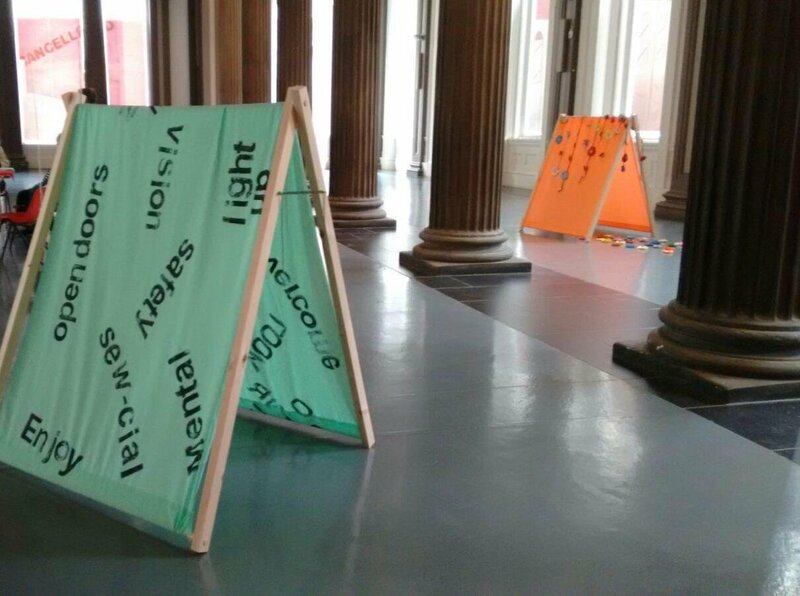 For one day only, we invited members of the public to join us in conversation and craft to sew together a communal blanket, which by the end of the day formed the final tent canvas in our exhibition. Conversations in the Crafternoons believe that when we create something, either individually or as a group, there is a sense of achievement. It is this sense of achievement, along with a space to put your ideas forward, which can improve personal and creative wellbeing.